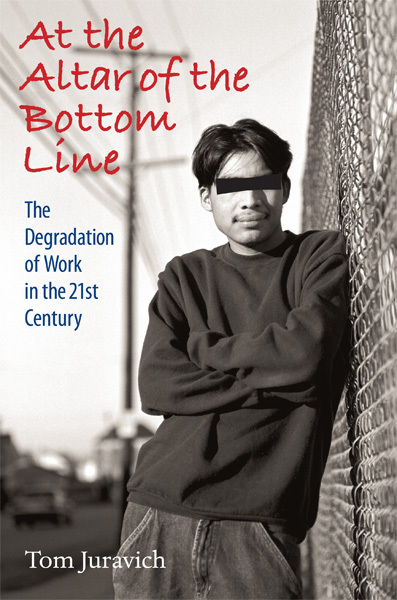 This is a beautifully written, compelling portrait of four groups of workers… The author is a gifted interviewer and his narrative lifts up the voices of workers themselves. In his new book Tom Juravich takes us behind the statistics of the economic collapse and into the work and lives of Americans who feel like they are being sacrificed At the Altar of the Bottom Line. At a Verizon call center in Andover Massachusetts, customer service reps find themselves overwhelmed by the pace of work and the constant monitoring. They describe a daily routine marked by regimentation, intense pressure to see, and unrelenting stress. In New Bedford, undocumented Guatemalans in the fish processing industry are fired is they don’t work fast enough, cheated out of wages, and mistreated by supervisors. Juravich describes a brutal raid by the U.S. Immigration and Customs Enforcement (ICE) that divided families and forced workers further underground. Juravich then take us inside the operating rooms at the Boston Medical Center, where hospital consolidation has brought a new “bottom line: philosophy that has fundamentally altered the way patient care is delivered. Surgery takes place almost non-stop driving many nurses from their chosen profession and leaving those that remain exhausted. Workers voices are front and centre in this highly readable book which is based on 85 in-depth interviews. It includes striking photographs by Paul Shoul and a CD that features a series of audio documentaries with excerpts from the interviews as well as four original songs written and performed by Juravich.